(TeleSur) In 2012 the United Nations published a report claiming the Gaza Strip would be unliveable by the year 2020. Five years later, after the summer 2014 full-on Israeli military assault against the Palestinian terrirtory, the U.N. published another report arguing Gaza had reached the point of un-liveability citing deteriorating infrastructure, alarming economic indicators and worsening social services. However, these numbers do not explain the surge in suicides that has taken over the Strip. Testimony of Palestinians who have committed suicide, even against their religious beliefs, reveal that occupation breeds powerlessness and hopelessness, making Gaza an unlivable place. The most devastating effect of Israel’s crimes is a generation of isolated men and women who can find no hope in the future. This year the world witnessed how thousands of Palestinian men, women, and children risked their lives walking towards the Israeli fence in the context of the Great March of Return to assert their humanity, and demand their rights as refugees to return to the ancient cities of Jaffa (now Tel Aviv), Haifa, Akka, or al-Quds (or Jerusalem). Between March 30, when the march began, and the end of May, at least 130 people were murdered. Numbers get muddled. The Israeli occupation forces kill protesters with snipers and bomb Hamas targets that also kill civilians. On July 14 two boys were killed at a park in Central Gaza after Israel bombed an alleged Hamas target. Pro Zionist talking heads around the world insisted on the old narrative that places blame and protagonism on Hamas, the religious-political group that rules the Strip. “Hamas is sending women and children to die for a photo-op” they say. Rawan Yaghi, a young woman who volunteers at the Gaza Community Mental Health Program explains in a video that these narratives only help to dehumanize Palestinians, to strip them of agency and political will. (Mohanned Younis, a 22-year-old student and writer who asphyxiated himself). Despite Israel’s insistence that it no longer occupies Gaza because it withdrew its troops and illegal settlers from the Strip in 2005, under International Humanitarian Law Israel continues to be the occupying power in Gaza because it controls its air and maritime space, as well as its borders. For Gazans, living without settlers or army bases within the Strip has come at the exacting price of living behind bars with no escape since 2007 under a widely condemned blockade. If you are a fisherman in Gaza, since 2012 you can only fish within 6 nautical miles, that is 194 nautical miles less than the area all coastal nations have a right to. If you wander off you risk being shot, your boat sunk, your livelihood stripped from you. If you are a farmer and wander too close to Israel’s unilaterally imposed Access Restricted Areas you risk being shot and killed, even if you pose no immediate threat to Israeli soldiers on the other side of the fence. Deadly incidents have been registered within 1.5 kilometers of the fence according to human rights groups. At least 1.3 of the 2 million inhabitants in Gaza are refugees. They have been expelled from their land in 1948, which now lies within Israel and face the progressive encroachment of the little territory they have left. Israel’s blockade translates into a people unable to rebuild after military assaults, medical patients unable to travel for treatment, students who can’t enjoy scholarships, families torn apart, people killed with impunity. (Palestinian girl Ala’ Abu Said, age unknown). Palestinians in Gaza cannot escape occupation and siege. Around 14,000 people were born in Gaza in 2007, the year when Israel started imposing an air, sea and land blockade. If you were one of them, you are an 11-year-old person who has witnessed three full-on military assaults by one of the world’s most powerful armies, you most likely have lost a loved one, and no one has been held accountable. It’s been four years since Israel launched operation Protective Edge against the besieged population in the Gaza Strip. For almost 50 days, between July 8 and August 26, Israel’s military killed 2,251 and injured 11,231 people, damaged 83 U.N. schools, 10 U.N. health centers, and destroyed 9,117 housing units. The attack was carried out two years after Operation Pillar of Defense, which resulted in over 100 civilian deaths according to the U.N., and four years after the 2008-09 Operation Cast Lead, in which Israeli forces killed between 759 and 926 civilians according to Palestinian and Israeli human rights groups. Such attacks could not be called wars as Gaza has no fleet, no airforce, no regular army. With each attack Gaza’s already insufficient infrastructure collapses further, making life unimaginable for most. “An 11 year-old child has not experienced more than 12 hours of electricity in a single day in his/her lifetime,” the 2017 U.N. report highlights. Today, Gazans have electricity for an average of four hours a day. Energy shortages affect a person’s ability to work online, to refrigerate food, to enjoy light during the night, but also undermines the functioning of wastewater treatment and healthcare facilities. This January Israeli media outlet Haaretz reported that 97 percent of water in the Gaza Strip was polluted by sewage or high salinity levels making it unsuitable for human use. This environmental and humanitarian disaster is man-made and it is a consequence of the lack of electricity required to operate Gaza’s wastewater treatment facilities. With no option to treat wastewater, an equivalent of 43 Olympic-size swimming pools of poorly treated sewage is being dumped into the Mediterranean every day. Having no constant electricity flow also affects hospitals and clinics. Salim Saker, a 54-year-old surgeon in Gaza recently told Physicians for Human Rights they endure shortages of antibiotics, morphine, basic medical supplies such as surgical sutures, anesthetics and disinfectants, which diminishes the ability to treat people in need of medical care. “I am deeply depressed. We feel abandoned. The world around us has no conscience. We want to live with dignity,” Dr. Saker told Physicians for Human Rights. In these conditions, doctors had to treat 15,000 Palestinians injured by Israeli forces during the Great March of Return. This June Fathi Harb, a 22-year-old Palestinian man, set himself on fire in a street in Gaza City. Fathi’s suicide is the still image of the unfolding mental health crisis in the besieged Gaza Strip, where levels of anxiety, depression continue to rise. Fathi Harb was going to become a father. He had been unemployed for years and could not provide a dignified life for his family. Israeli hostilities continue to worsen the economic situation in Gaza. According to the U.N., the 2014 military assault caused Gaza’s productive sector direct damages estimated at US$418 million and indirect losses estimated at US$451 million. On too of this cost Gaza bears the brunt of being denied the freedom to rebuild its economy as a result of the blockade, which between 2007 and 2009 “led to the closure of 95% of Gaza’s industrial establishment,” the U.N. report affirms. This June the U.N. estimated poverty in the Strip reached 53 percent of the population, unemployment reached 49 percent in the first quarter of 2018, and at least 47 percent of Gaza’s population experience food insecurity. Palestinians are denied the right to self-determination as a people, the right to life as individuals and the right to work, water, healthcare and food security. These are the conditions that “would drive somebody to risk their lives knowing that there are snipers who are willing to shoot, maim or kill them,” the U.N. report said. For the United States and Israel, the audacity of Palestinians to protest against the subhuman conditions they have been forced to live in must be punished. The U.S. announced it was cutting the aid provided to the U.N. Relief and Works Agency (UNRWA) for Palestinian refugees currently living in Gaza, the occupied West Bank, Lebanon, Jordan and Syria. According to Pierre Kraehenbuehl, head of UNRWA president Donald Trump withheld US$305 million in funding, leaving the agency with an insurmountable deficit. Meanwhile, Israel has cut off all “exports or marketing of goods… carried out from the Gaza Strip,” limited the goods entering the Strip to food and medicine that will be “approved on a individual basis,” and carried out extensive airstrikes against Hamas and civilian infrastructure in Gaza. These measures are meant to deter Palestinians from flying incendiary kites into Israel and force Hamas to stop launching rockets into neighboring Israeli towns. However, as they fail to recognize the humanity and rights Palestinians demand, strangling the Strip and plunging Gazans further into hopelessness, the people of Gaza are more likely to continue resisting the Israeli occupation and aggressions by the limited means at their disposals, even if all they have left is their own lives. 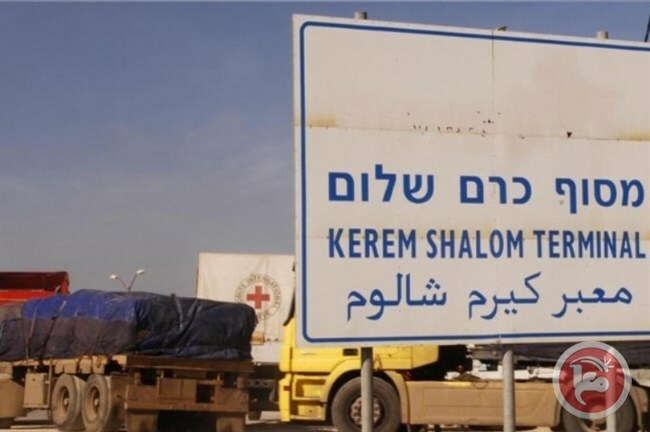 Featured Photo: Kerem Shalom Checkpoint for Gaza via Ma’an News Agency.